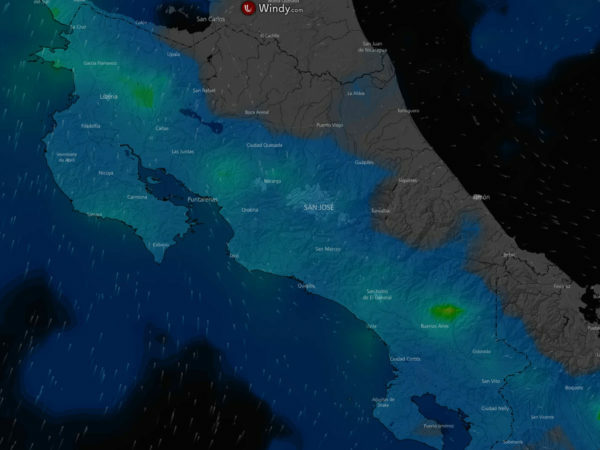 Click Here or on Image to Animate – A tropical storm or hurricane in the Caribbean acts like a big fan sucking warm moist air from the Pacific Ocean across Costa Rica. When the air hits the mountains it’s forced up, expands and cools forcing the water out as rain (source windy.com). Typical rainfall pattern when warm moist air from the Pacific is pulled across Costa Rica from west to east by a rotating low pressure system in the Caribbean (a tropical storm or hurricane). The Caribbean coast ends up in a “rain shadow” since most of the moisture has been driven out of the air by the time it flows down the eastern slope of the central mountains. The Caribbean side was not dry but escaped the brunt of the rainfall. The Waze App has some live info on closures. However, there is no data for some large segments of the roads listed below because there are no cars on them transmitting data. Although the update below includes the status of major roads impacted as of October 21st the list below is NOT comprehensive. There are many other minor closures. It may be several days to several weeks before some of the roads reopen as the structural damage is still being assessed but in many cases entire bridges or sections of road are completely gone. No major changes have been announced in the past few days. A new weather system (Disturbance 93L) that brought significant rainfall October 22-26 moved north without having caused major damage. 909 – near Hatillo – this is located about 25 km east of Tamarindo but impacts local traffic only. It does not impact traffic between the beaches and Hwy 21 (the Nicoya road). 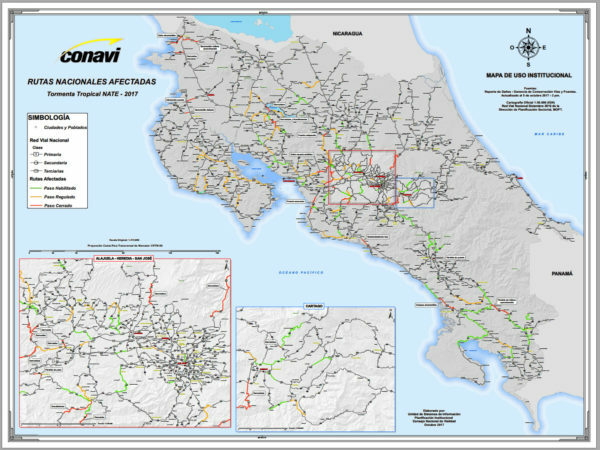 PDF map with details of initially impacted roads from Costa Rican Highway Department (CONAVI) (many of these have been repaired and reopened – see below). 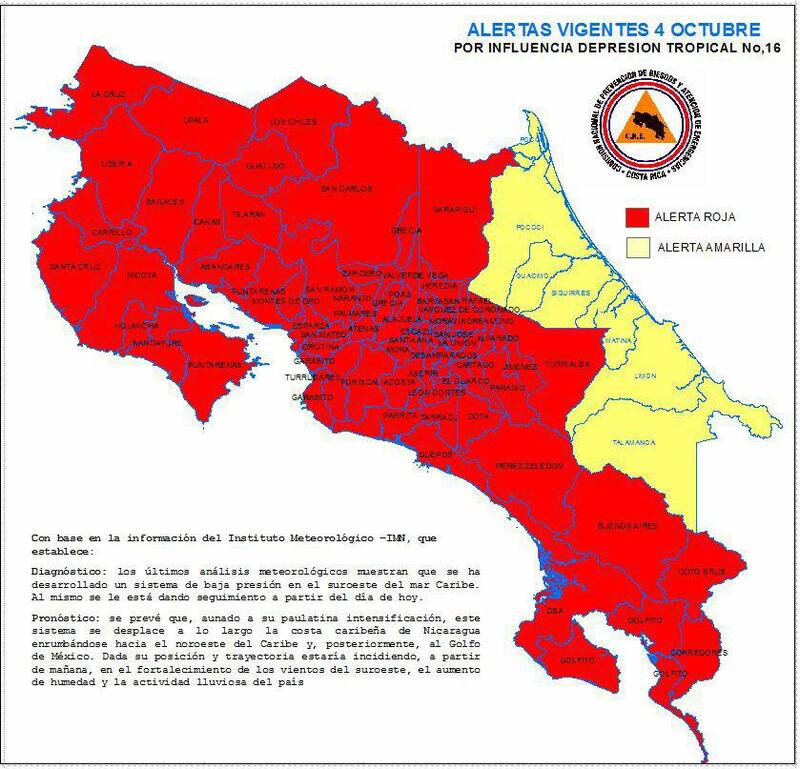 October is normally the rainiest month of the year in the central mountains and on the Pacific coast. That pattern will likely continue but may cause more landslides, road and bridge outages than normal because the ground is hyper saturated from Nate. Upcoming weather is predicted to be milder with seasonal rainfall but no major storms. All of the data I’ve seen focus on Ophelia and LO-17 low pressure systems which are still far to the east but very far north of Costa Rica and predicted to stay up north. The only new systems on the radar are in the neighborhood of the Bahamas.